From a universal typological perspective, we sort of expect vowel systems to be more or less symmetrical. There is a feeling of orderliness about the vowels of Latin, Spanish, Modern Greek, Japanese, and Swahili, with their 5-vowel system nicely balanced between front and back, high and low. Orderly 7-vowel systems like Italian add a further distinction of height, with ɛ and ɔ. Adding a backness distinction between low vowels, æ vs ɑ, as in Farsi, and/or adding front rounded vowels y, ø, Finnish-style, does not disrupt the equilibrium. Nor does adding back unrounded vowels ɯ, ʌ, Korean-style. Nor does a tense-lax distinction, pairing i with ɪ and u with ʊ as in English or German. From this typological perspective English is however rather messy — particularly the types of English where historical monophthongs have developed into assorted diphthongs. (Yes, it’s GOAT that I’m thinking of particularly.) The Anglo-American NURSE vowel, ɜ or ɝ, doesn’t actually disrupt the balance, but from an international perspective is an extremely unusual type of strong vowel. The prize for unbalanced vowel systems seems to go to Pacaás Novos, aka Wari’, an Amazonian language spoken near the Bolivia/Brazil border. It has four mid/high front vowels, but only one back vowel. More unusual still in Wari’ is one of the items to be found in the consonant system, namely the ‘dental affricate’ t͡ʙ̥, which consists of a dental stop plus a bilabial trill, together forming a single unit. are a helpful, kind people who speak a groovy language. Sadly for us, though, younger speakers are reportedly simplifying their consonant system. Rather than articulate t͡ʙ̥ they prefer to use just the first part of the affricate, so reducing it to t.
And sadder still they'll probably be speaking Portuguese in a few generations. Dan Everett does find them, doesn't he? 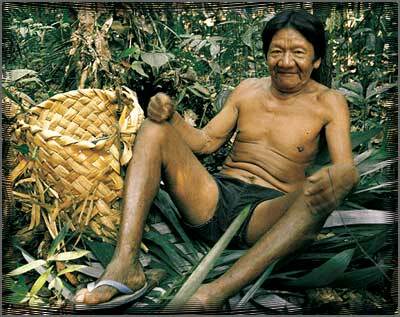 A pity Chomsky doesn't believe he and his Pirahã exist. By "simplifying their consonant system" I suppose you mean these younger speakers simply merge t and t͡ʙ̥, which is a bit surprising. Is there any evidence that the first part of the affricate survives as a distinct t-type phoneme with some less exotic distinctive feature? One could imagine some less turbulent form of aspiration maintaining the distinction, perhaps. @mallamb: Well they can't both be right, can they? If Everett's analysis of Pirahã is right and it constitutes a counterexample to Universal Grammar, does that mean the whole theory collapses completely? Sorry - ignore me - we're going off topic. Funnily enough, Pirahã has a similar sound [ʙ] as an allophone of /b/. Are we back on topic now? Oh I think we're on topic all right with rude remarks about atavistic ideas of the inerrancy of Universal Grammar, especially in its attempts to swallow phonology and phonetics whole. I believe in Dan Everett, and so apparently does John, and my allusion to the pity of it all was motivated by my all-encompassing belief that the pity is that Chomsky is Chomsky. Isn't it strange to have labiovelars but to not have [u]? Just seems naturally odd, to me. I don't have any scientific data to base this on. Everett stated that [ʙ] was a domain-specific phoneme, used only when foreigners were not around and during the hunt (if I recall correctly.) For this reason Everett didn't find it for quite a considerable period. Is it possible that contact has lead to a shrinking of this domain in Wari', leading to a shift from [t͡ʙ] to [t]? @Richard L: yes, Everett said that the Pirahã were so used to being mocked for saying /b/ as [ʙ] that they avoided it in the presence of foreigners and always pronounced it as [b] instead. Perhaps their /o/ has a realizational range approaching [u] or perhaps the labiovelars are not as labiovelar as they're cracked up to be, having for example allophones like [o̯] which could just be non-nuclear /o/. And then is [wo] or [o̯o] attested at all? Japanese /u/ is [ɯ] and the alleged /w/ is very marginal, only appearing (and disappearing) before /a/ as [ɯ̯]. And whatever the realizational correlates of the Wari' ʙ̥ off-glide and the "labialization" of the velar plosive and fricative, what is the evidence that they are simultaneous distinctive features rather than allophones of this "labiovelar" approximant? I seemed to remember Everett stated that [ʙ] was a domain-specific phoneme in Pirahã. How extraordinary if foreigners have been Heisenberg-type observers in both that and Wari'. If I'm not mistaken, dental affricaties of that type are an areal feature in several Amazonian languages, with voiced and voiceless versions in various languages. They usually bear fairly low functional load, and sometimes aren't clearly phonemic. I believe Wari' actually has a voiced version as well, at least in a few words. Ian Maddieson has remarked that 4 vowel systems tend to be asymmetrical in lacking back vowel distinctions. In a language I work on, Ixcatec, /o/ and /u/ are in free variation with each other. There are only four oral vowel contrasts: /i/, /e/, /a/, /o~u/. One wonders if the system in Wari' evolved from historical vowel allophony in a 4-vowel system. This might shed light on its asymmetry. 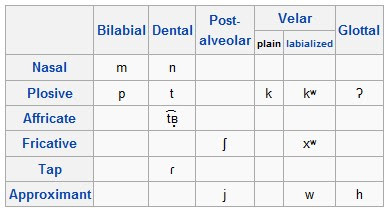 I remember reading somewhere that a number of Amazonian languages had 4 vowel systems. Californian English might be a close second to Wari' though. The near-close back lax vowel /ʊ/ is produced as [ɨ], the close back vowel /u/ is produced as [ɨw], and the close-mid back vowel /o/ as [əw]. Though this does not represent all speakers, it reflects a system with no back vowels whatsoever. If I remember correctly, in the Turkish eight-vowel phonology [a] is treated as the unrounded equivalent of [o], correct? That's what the Wari six-vowel system reminds me of. If that thinɡ is an affricate, I'm a Cornish piskey! Arapaho has a strange vowel system with no open vowels. I know Scottish English like that! @ Christian: I believe there are other American accents like that too. Southern comes to mind. It's funny, because I always thought of the Farsi vowel system as being asymmetrical. For one thing, the low back vowel is rounded and the low front one isn't. I guess that isn't important when it comes to the symmetry of a vowel system. Scottish accents with "no back vowels whatsoever"? I may be very dense but I don't get it. Sorry, Harry. I was just being facetious about Scots whose back vowels are all strongly centralized. BET is a checked vowel while NURSE and THOUGHT aren't; also, if you throw diphtongs in, you have /OI/ (CHOICE) but no /EU/ for example; in many (most?) accents there's a CURE-FORCE merger ongoing but no corresponding NEAR-SQUARE merger; and so on. Yeah, that is true about the checked-free distinction, however, I see no reason of postulating such a distinction on this level of description (seen from a "universal typological perspective"). CHOICE is a real anomaly, fully agreed. Centring diphthongs do really seem to make things messy, though (although they may be entirely excluded from the phoneme inventory). I support mallamb's inquiry. If a vowel system has no contrast between /u/ and /o/, surely it must have a phonemic range between these two cardinal vowels. As such, the usual vowel system diagram we use can be misleading. I study Etruscan which also lacks a contrast between /o/ and /u/ (as do a slew of other languages then and now, btw; cf. Hittite). Judging by Latin reflexes of Etruscan names and words, /u/ was expressed by a range of allophonic values hovering around that back-high region. So in effect, we're only speaking about a "one-off asymmetry", ie. it's really only one vowel off from a pleasing symmetry. What I'd call spectacular is a system that is *two* vowels off from symmetry. I don't know of any offhand. Does anyone else? Does Wichita count? It has /a e i/, where /a/ is central and /e i/ are distinctly front in, apparently, all environments. «Let me hazard the guess that /u/ came to be blamed on the preceding consonant, creating the labiovelar phonemes and /tʷ/ in the process; /tʷ/ later became unrounded to [t͡ʙ̥]. «Perhaps their /o/ has a realizational range approaching [u] or perhaps the labiovelars are not as labiovelar as they're cracked up to be, having for example allophones like [o̯] which could just be non-nuclear /o/. And then is [wo] or [o̯o] attested at all? Japanese /u/ is [ɯ] and the alleged /w/ is very marginal, only appearing (and disappearing) before /a/ as [ɯ̯]. You may have intended your disappeared comment to be an answer to that, and it does give some corroboration of my suspicions, but you're not being very precise about this language in the Amazon.